By infection in meninges meningitis or brain fever is caused. (i) Duramatter - Outer thick, fibrous attached to inner part of cranium i.e. Endorachis. (ii) Arachnoid - Middle layer of meninges. Net like in appearance. Made up of squamous epitelium. (iii) Piamatter - Inner most layer, thin, membranous, blood vessel present. Gives nourishment to brain. 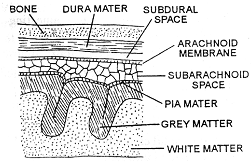 This layer enters into dorsal wall of brain & form choroid plexus or tella choroidea. In man choroid plexus are 5 (2 in lateral ventricle, 2 in 3rd ventricle & 1 in 4th ventricle) in rabbit choroid plexus are 2 (1 in dianchephalon & 2nd in medulla oblongeta). Choroid plexus is responsible to form C.S.F. (cerebrospinal fluid). CSF is formed 20 ml/hr. Note :- Arachnoid and piamatter are collectively known as leptomeninges. In fishes meninx is menias premitiva. In amphibia arachnoid is absent. Between meninges sub dural & sub arachnoid spaces are present filled with little CSF. Carbohydrate characteristic chemical features include: Select one: a. the potential to form multiple hydrogen bonds. b. the existence of one or more asymmetric centers.